Aid to senior official arrested by PA security forces on suspicion of espionage. Erekat acknowledges incident. An assistant to Saeb Erekat, a long-time senior official in the Palestinian Authority (PA), has been arrested by PA security forces on suspicion of spying on behalf of Israel. Erekat has acknowledged the facts of the case, which were published by media based in Ramallah. The suspect is accused of working for Israel for the past 20 years. He is believed to be in a Palestinian intelligence facility at present. 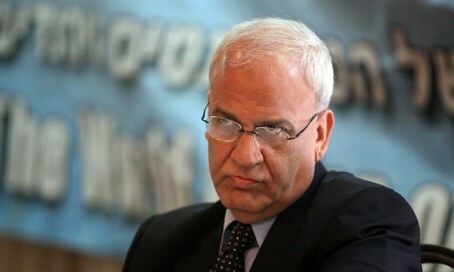 Erekat served as the secretary-general for the PLO and headed the Palestinian negotiating team during peace talks with Israel. He often threatened Israel with ended the security agreement and worked hard to stop Israeli political efforts abroad. He has recently said that "the situation of the PA is not stable, and it lacks authority. Its President needs approval from the [Israeli] Civil Administration in order to travel from place to place. Even the PA's keys, which some claim that we hold, are no longer in our possession, because Netanyahu took them." He has also compared ISIS terrorists to Jewish residents of Judea and Samaria. "Defeating ISIS requires an end to the occupation and the creation of a Palestinian state. There is no difference between what ISIS does in Syria and Iraq, and the killings and burning of children by settlers in the West Bank," he said.